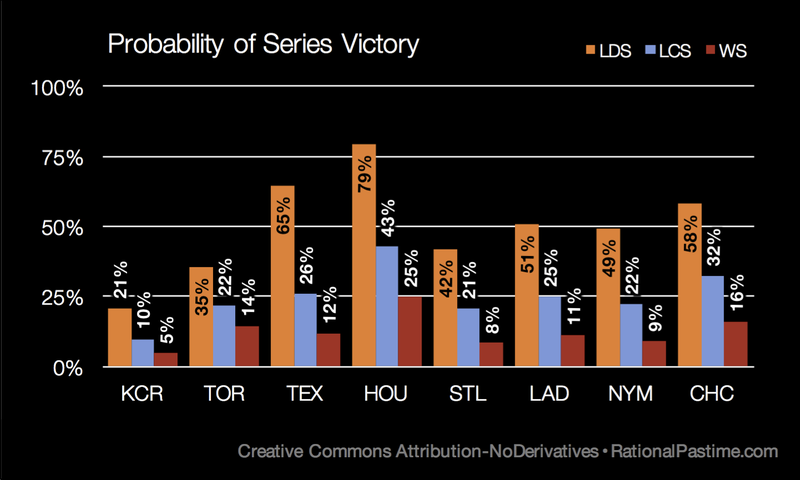 This post is part of a series about the 2015 MLB Postseason. Follow along here. Following another exciting day of Division Series action, one American League squad inched closer to elimination while another earned one day's reprieve. The Houston Astros are now 3:1 favorites to win the World Series after going up two games to one on the Kansas City Royals (now 20:1 underdogs). Meanwhile, the Toronto Blue Jays fought back down two games to one, earning a fourth game in Arlington against the Texas Rangers. 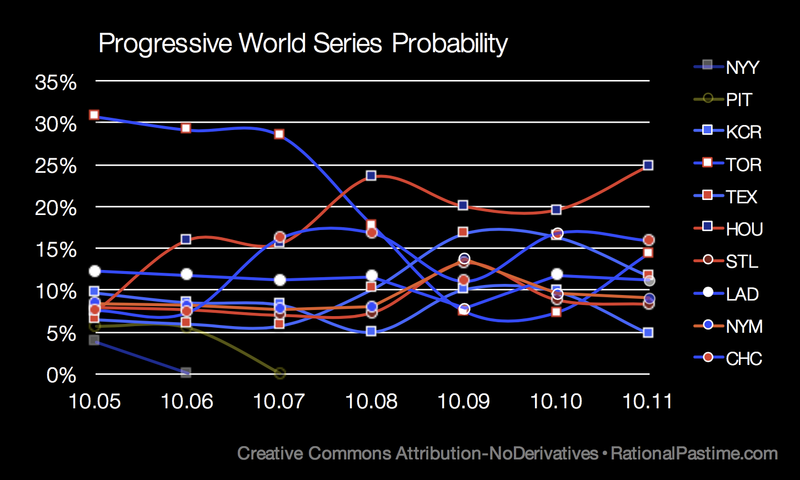 Though still favored to advance, at 8:1 to win it all they still trail the Jays (at 6:1) in the Fall Classic. National League play resumes today, with all Senior Circuit clubs tied at one game apiece. 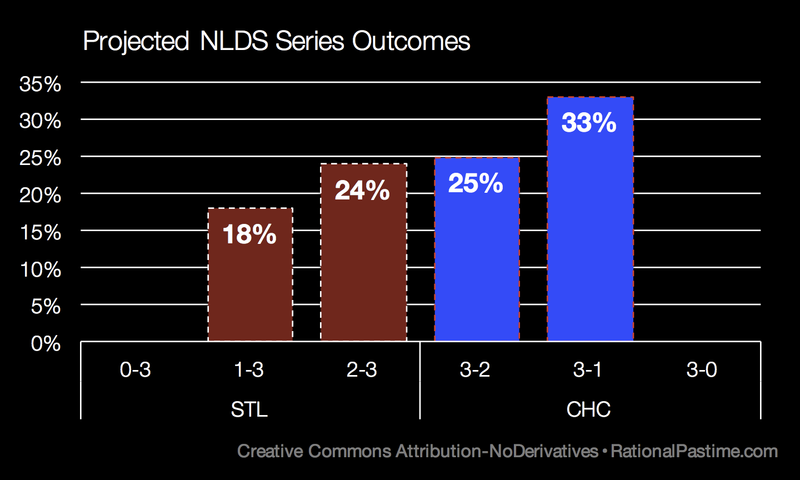 The Chicago Cubs remain the NL's best chance to win it all at 16%, followed by the Los Angeles Dodgers at 11%. The Royals are 4:1 long shots to survive to the next round; my model gives the Astros nearly a 60% chance to finish their Kansas City rivals at home this afternoon. 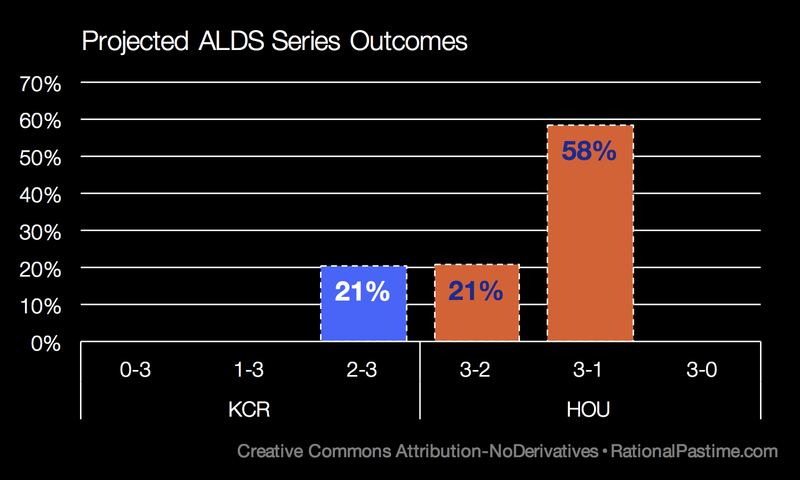 Even if the series returns to KC, the Astros will enjoy a slim advantage. Though Toronto is in much the same position as Kansas City, down 2-1 and facing elimination, my RPScore calculations still figure the Blue Jays are a better team than the Rangers. 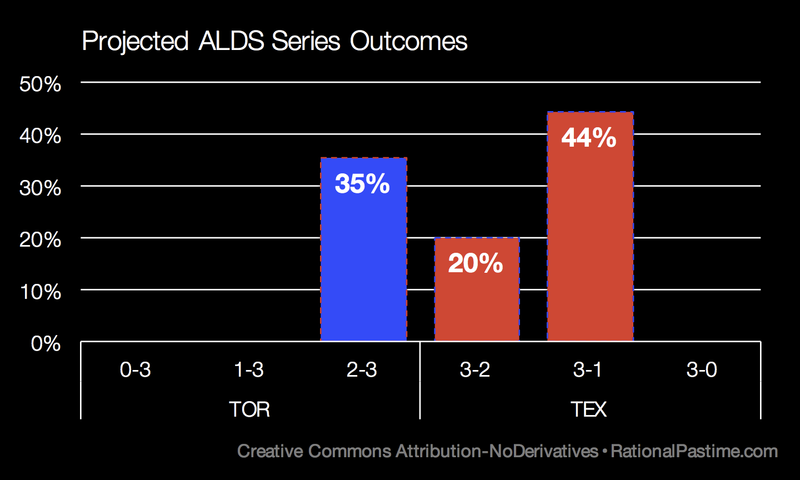 Therefore, the playoff simulator has Toronto advancing more often, twice out of every three runs or so. Nevertheless, the simulator also gives Texas a pretty good chance of finishing what they started at home in Arlington. The Chicago Cubs are 2:1 to finish off the Cardinals in their two games at Wrigley and 58% favorites to advance to the NLCS for the first time since 2003. 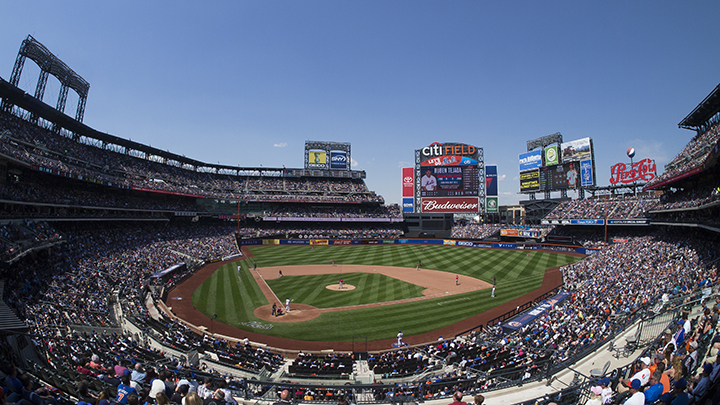 The Mets head back to Flushing looking to avenge the loss of Ruben Tejada. As we all know, the best revenge is living—and playing—well. 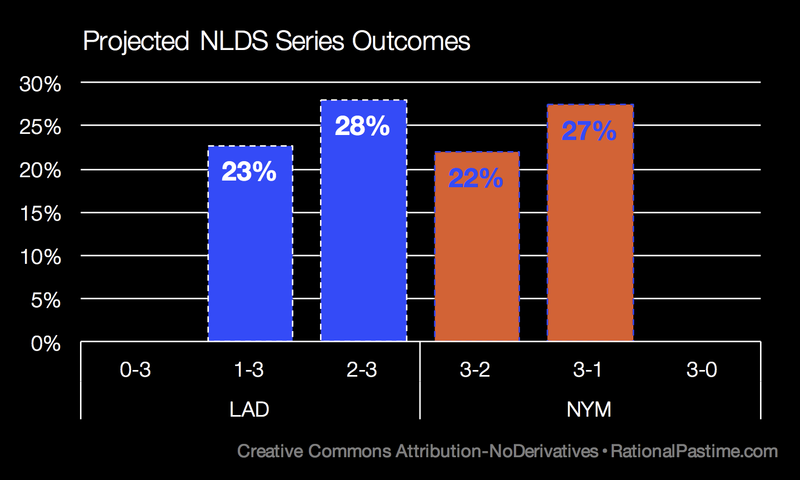 There is a 49% chance that the Mets will live and play well enough to advance to the NLCS, sending the Los Angeles Dodgers and Chase Utley home for the winter. Stay tuned to see what the Royals and Blue Jays chances are should they survive, and what the National League picture looks like following today's gauntlet.